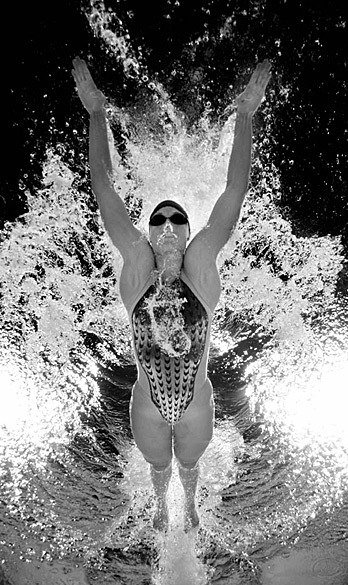 Amanda Beard of USA competes in the women's swimming 200 metre individual medley final on August 17, 2004 during the Athens 2004 Summer Olympic Games at the Main Pool of the Olympic Sports Complex Aquatic Centre in Athens, Greece. About 100 cheese-pies and 50 Greek Salads later, I found myself on Day 16 of the Olympics on my final assignment, Taekwondo. This was the 3rd Games I'd had the opportunity to cover for Getty/Allsport (Sydney, Salt Lake) but by far was the most hours I've put in and the hottest working conditions. I was also scarred for life having to borrow a pair of Heinz Kluetmeier's boxers (he claimed they were clean) to fish out my underwater housing from the pool after someone stole my swimsuit. So, I found myself mat side (already thinking how I was going to weasel my way into a 1st class upgrade on my flight home) with about 50 other photographers, 20 of which were Korean press covering the gold medal favorite. I was also with my fellow Getty staffer Jamie Squire, with whom I passed the time in between rounds text messaging nonsense. Finally, the introduction to the Men's over 80kg gold medal match commenced and the stadium roared since there was a Greek local favorite going head to head with the Korean champ. Squire noted that it was the loudest venue he had been to and I agreed. The bell rung, actually this wasn't boxing, but a martial art so they bowed and then began screaming and kicking at each other. The Greek came out and quickly scored the 1st point (the crowd erupted), and then the 2nd point (the stands shook), then frantically goes in for the third time. However, this time the Korean Champ slipped back and to the side and then did a reverse roundhouse kick to the temple of the taller Greek opponent, knocking him senseless to the canvas in the 1st round. The crowd was dead quiet as their hero laid on the floor. Then out of nowhere the scream of one man rose up: the Korean Champ was pumping his fist yelling. As quickly as the crowd went silent, they erupted in boos. The Korean Champ then grabbed a his nation's flag and started doing laps around the stadium as all the Korean photographers scurried, fell and rolled on the floor in front of him to catch the moment. I was not only afraid for the safety of the frenzied photographers, but the safety of the Korean athlete who was hurdling fallen photogs and had an angry mob surrounding him in the stands. But then the Greek hero came to, the crowd cheered, and true to the Olympic spirit the Korean Gold-Medalist ran to his defeated opponent, hugged and kissed him and then did a victory lap holding hands. I then joined the Korean media backpedaling in front of the men. After shooting the medal ceremony, in which the disgruntled French bronze medalist threw his medal into the stands, I made my own fist pump because I was done. And true to the Olympic spirit, I did get the 1st class upgrade on the way home.